Sophie Weston, channel marketing manager for Geberit, explores the significance of multi-sensory design in the bathroom – and how industry professionals can help their customers achieve it. In all avenues of modern life, whether that be in our time dedicated to leisure, work or family, we can often find ourselves operating at a rate of knots, with fewer opportunities to switch off and more distractions too. To combat the growing complexity of contemporary living, it should come as no surprise that design requirements and product specifications are evolving in the home. It is increasingly important that a well-designed bathroom should offer tranquility and a place of respite where overworked senses can be restored. Now, the onus is on bathroom manufacturers and industry professionals to press the all-important pause button for the modern consumer. Driven by the age of technology, it’s difficult to imagine life before our personal and professional worlds were so dominated and “switched-on” via smartphones and similar devices. In fact, research by Geberit shows that 73 per cent of people struggle to find time to relax and a staggering 78 per cent say that they spend more time online than they do sleeping. Geberit’s research revealed something particularly interesting for professional builders – that, in the quest for some respite, the most popular place of refuge for homeowners was the bathroom. With customer expectations and requirements changing, the days of a tradesperson simply turning up at a customer’s house to fit pipework and a bathroom suite are numbered. The demand now is for someone who can guide product choice, as well as have a view on the latest trends and product innovations that provide sanctuary from the world around them. Customers are increasingly looking for a complete end-to-end service, from product selection right through to delivering the finishing touches. Typically, the main areas of focus within bathroom design include materials, textures, colours and patterns. However, the market is evolving and there are other aspects that also warrant consideration. For example, at Geberit we know that the potential for well-being is at its highest when the design of spaces is informed and enriched by the four senses – sight, sound, touch and scent. Visual: Creative installation systems for wall-hung sanitaryware can help you achieve the illusion of space in the bathroom, reducing the visual distraction of clutter for your customer – not to mention the added hygiene benefits. Therefore, it’s crucial for tradesmen to consider prewall installation systems with integrated cisterns. Importantly, prewall installation systems such as the Geberit Duofix system are specifically designed with installation and ease of maintenance in mind. The Duofix system makes concealing the cistern inside a drywall quick and neat by eliminating the need for additional, carefully positioned studding. The result? 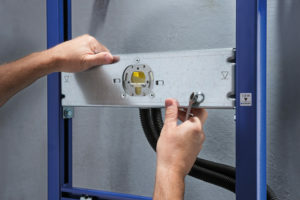 A strong, reliable and leak free finish, thanks to its one-piece blow moulded cistern, angle bracket fixings and snap connectors. 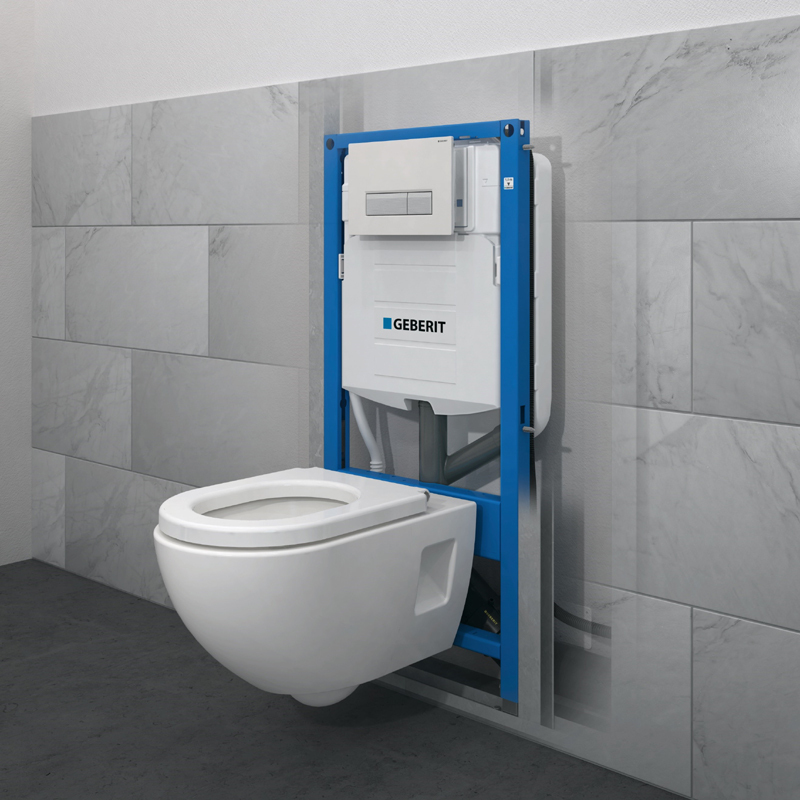 Fully-guaranteed, affordable wall hung ceramics ranges are now readily available through most merchants, bathroom specialists or online, debunking the myth of wall-hung toilets being a luxury-brand item. Auditory: In close-quarter environments, the need to minimise bathroom noise is particularly important. To meet this need, advancements have been made, including acoustically optimised pipework, such as Geberit Silent-PP. Silent-PP is made from mineral reinforced polypropylene, improving the physical properties of the material and effectively reducing natural vibrations and noise. Enhanced polypropylene could even provide an opportunity to deliver overall project cost savings for your customer, since it removes the need for lagging on some projects. Scent: Often overlooked, scent has a strong effect on your customers experiences. However, with Geberit’s latest DuoFresh technology, the air in the bathroom space can be effectively cleaned by passing unwanted odours through a replaceable carbon filter. The DuoFresh technology is discreetly tucked inside the cistern and can be turned on by the touch of a button by the user. Touch: Family bathrooms are high traffic areas, which places a premium on hygiene. Automated, touch-free experiences, with sensing technology in taps, lids and flushes, not only minimises the spread of germs but also makes the entire space quicker and easier to clean. Tradesmen seeking the very best in hygienic, sanitary technology for their customers should look no further than a no-touch flush. Manufacturers have responded to the demands of consumers, supporting the market with continued development of everything from inspiration on room layouts to the innovative bathroom technologies like those mentioned above. Now the opportunity lies firmly with industry professionals and tradesmen. With the trend for wellbeing showing no sign of letting up, finding the formula for a well-considered sensory design in the bathroom could be the key to unlocking added-value design and installation projects.